Raging Rapids is a nicely designed tile puzzle by Thinkfun (formerly Binary Arts). It consists of a raft and twelve paddlers. The paddlers are supposed to fit inside the raft, all facing the same way. Each paddler has on its base a rectangular tile, with dents and tabs along the edges so that it is shaped a bit like a jigsaw puzzle piece. The raft has a large rectangular floor, also with dents and tabs along the edges. The paddlers are marked on the bottom of their tile by a unique letter, ranging from A to L. The raft and the paddlers are shown below. In case you want to place the pieces back into the packaging, the arrangement used in the packaging is reproduced in the next picture. Note that the red rope lies on the right, and that paddler B in the top-right corner is the only one facing left. In the packaging, paddler B is actually placed in a separate compartment. There are two challenges. The first is to get all paddlers in the raft facing in the direction of the red rope. The second is to get them all to face the other way. 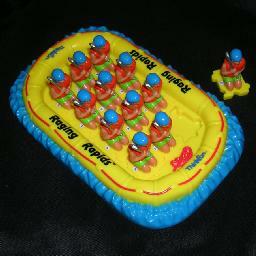 It is actually a little tricky just to get all the paddlers in the raft regardless of their directions. The picture below shows the solution of the first challenge, where all paddlers face in the direction of the red rope. The solution is unique. There are two paddlers that have a symmetrical base, namely D and E. These paddlers can therefore face either way. All other paddlers occur in symmetrical pairs, namely A and G, B and C, F and L, H and K, I and J. If you swap the two pieces of such a pair, they will both face the other way than they were before. From these facts, it is easy to transform the unique solution to the first challenge into the unique solution of the second challenge. If you completely ignore the directions of the paddlers, then there are only 59 essentially different solutions (where swapping a symmetrical pair is not considered different). These solutions are listed below, with the red rope on the left hand side. A capital letter means a paddler faces left, a small letter to the right. The standard solutions with all facing the same way is in bold letters.